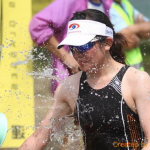 Ya-Chiao has been swimming since she was in the third grade and racing in the pool has been an integral part of her life ever since. Currently swimming for the National Taiwan Normal University, she took bronze in 400m freestyle in the 2014 Intercollegiate Games. Although she has trained as a tri-athlete for only a year, she is already a podium regular in the major triathlons here in Taiwan.